You know when you finally pull off a perfect cat eye and all is right in the world? We owe this rarely accomplished feat to one art: Calligraphy. Calligraphy has been recognized as a visual art from in societies all around the world, and all of the modern reincarnations of this art proves just how stunning it can be. In today’s world, calligraphy is generally seen on gorgeous works on paper and of course, digitized for all to see on blogs and social media. But there’s also another form that calligraphy takes, one that uses humans as the canvas. This artful display of letters and ink now has a hold on the beauty industry too. When I first thought of calligraphy and makeup, the first thing that came to mind: the cat eye. Winged eyeliner is often applied with a liquid liner brush or felt tip eyeliner pen, which are often modeled after calligraphy pens and brushes. Take the now famous Make Up For Ever 400 Calligraphy Brush, from their artisan brush range. Used for everything from creating the perfect cat eye (when paired with a gel liner) to brow touch ups to bold blips, the triangular shape makes it precise yet versatile—exactly why calligraphers use this shape in their lettering work. As mentioned, felt tip pens, like the Hourglass Calligraphy Liquid Liner, are another result of makeup artists inspired by calligraphy. It’s obviously nice to have the liner and applicator in one, but the real sell is that it creates the perfect liner flick (without smudging) – one of makeup’s great mysteries. Of course, calligraphy isn’t just for the purveyor of the cat eye. If you’re more experimental with your eyeliner game, you can use choose from different sized pens to perfect styles like the shooting star, graphic and divergent line designs I’ve shown how to create in this post. 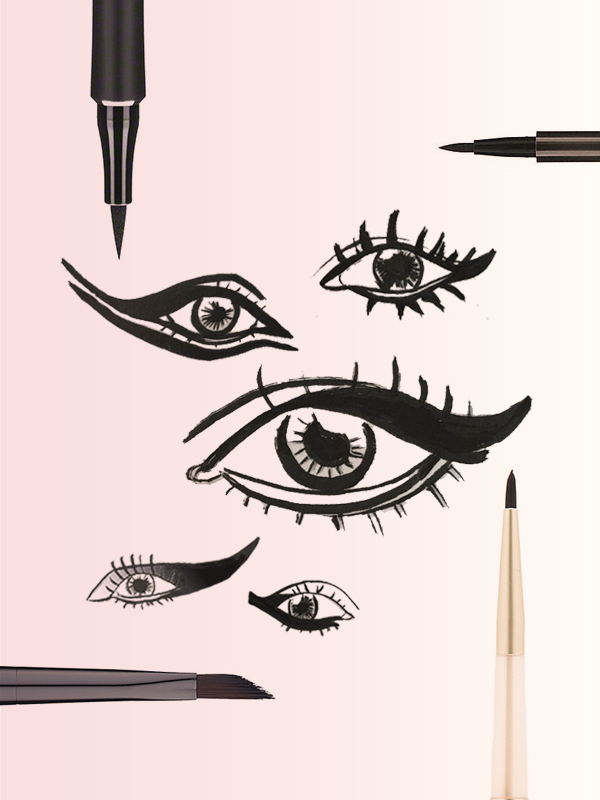 Other, small eyeliner brushes (Stila La Quill comes to mind) allow you to pull off a range of tricky feats, like a killer bold wing and a delicate tightline. So, we’ve covered the basics, with eye brushes and pens, but calligraphy has influenced the beauty industry in countless ways. Other luxury brands like Christian Louboutin have created entirely new products based off of calligraphy’s precision and 3D effects. This Lip Definer may be a beauty splurge, but it just goes to show what you can do when you get truly artistic with your makeup look. When it comes to calligraphy and makeup, it’s all about the applicator. If you have even half of the patience of a calligrapher, you can allow that drama and romance to influence your everyday looks. Keep this in mind when experimenting with liners, lip pens and even shadows. Art, inspiring as always! Would you like to see more calligraphy-inspired makeup looks?